Shashlik (or Shish Kabab) is one of the foods cooked by the wise girl in the story of Baba Yaga's Son found in a chapter in my novel The COOKBOOK. 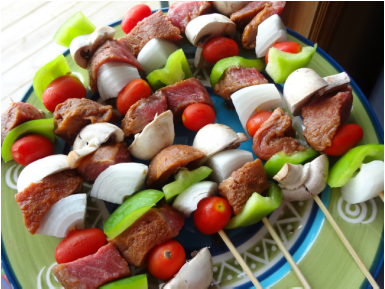 Shashlik is skewered meat, originally made of lamb. It is found across a wide geography from Poland to the Middle East to Central Asia. It seems to have been something borrowed by the Cossacks from Crimean Tartars. There are differences in the way it is prepared depending on the region or country. Today it is also made of pork, beef, chicken or fish. The meat is often marinated in wine, fruit juice or vinegar, combined with spices, herbs and onions. The skewers may be threaded with meat only, or with alternating pieces of meat, vegetables and fat. The vegetables are often tomatoes, mushrooms, onions and bell peppers. Shashlik and Shish Kabab seem to be the same thing, or very similar. If anyone knows the differences, then please Contact me and let me know. Here is a simple recipe but it is advised to experiment and get creative depending on your preferences. This should be good for four people, so just double or triple the recipe depending on how many people you have. 1. Combine the lamb, olive oil, lemon juice, pepper, salt and red pepper in a bowl. Marinate it at for 2-3 hours, or over night in the refrigerator before cooking. 2. Thread 6 or 7 cubes of the marinated lamb on each skewer. It helps to apply olive on the skewer before putting on the lamb. 3. Thread the vegetables on separate skewers, alternating the types of vegetables. 4. Cook the lamb approximately 10-12 minutes while turning regularly. 5. After 5 or 6 minutes of grilling the lamb put the vegetable skewers on the grill. The trick is to keep the vegetables crisp, so be careful not to overcook them. And that's it. 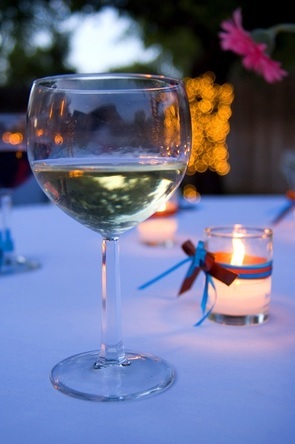 This is a wonderful meal for a summer evening with friends, family or just with that special person in your life. Or, try something fun. Invite your friends and enjoy the food and a good discussion about The COOKBOOK.